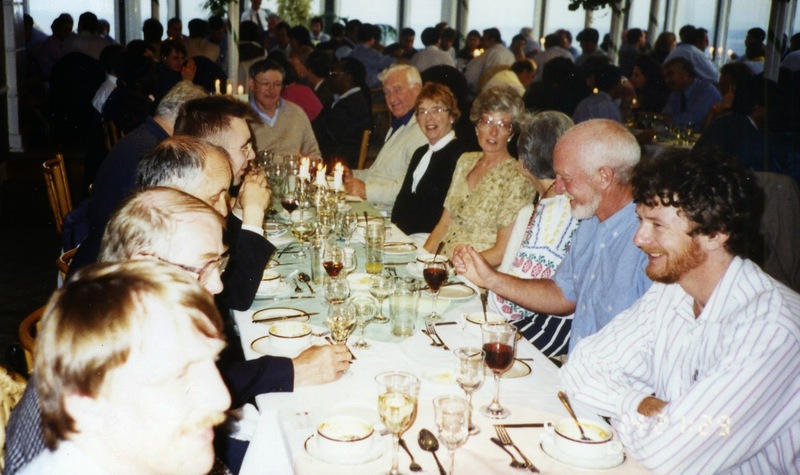 With the next MEI Conferences in Falmouth only two weeks away, its nice to reminisce on the first of the annual Minerals Engineering series of conferences to be held in Cornwall, which opened at the Tregenna Castle Hotel in St. Ives 20 years ago in 2 weeks time. 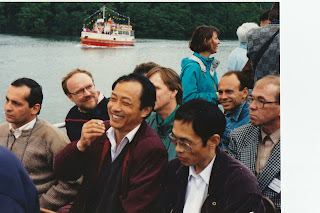 The conference was attended by just over 100 delegates, and apart from 3 days of presentations, there was a memorable conference dinner at the Land's End Hotel and an evening boat trip from Falmouth up the River Fal to Malpas near Truro. 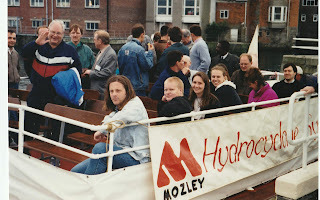 Below are a few photos which remain in our archives. "Having completed my PhD, I had been travelling for a year and was located in a somewhat penniless state in London. I determined to write up my work for your journal [Minerals Engineering] and attend your conference to present it. I took on a menial job and Frances and I scraped together every last pound we had to attend the conference. While there I got the first serious airing of my PhD work, and made some crucial contacts. I met Walter Valery, of the JKMRC, and through him I was offered the JKTech agency for when I got back to South Africa. I also met Prof Cyril O'Connor of the University of Cape Town, the institute through which I had studied for my PhD. He encouraged me to come and start a comminution research group at UCT, to supplement the growing flotation group. These two contacts lead directly to the position I have held for the past 7 years, as Southern African Agent for JKTech, and leader of the comminution research group at UCT. Both facets of my work have developed into a wonderful career." 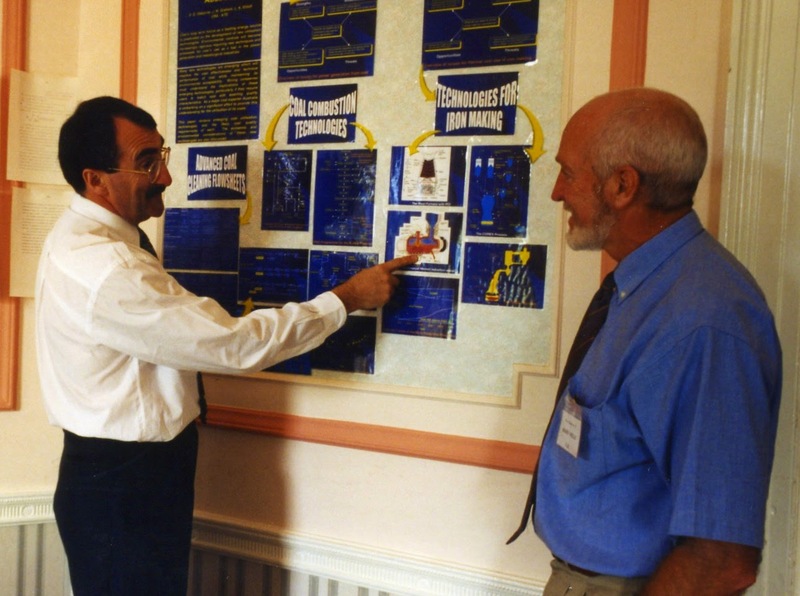 Malcolm later developed the comminution group at UCT into a world renowned leader in the field, now headed by Prof. Aubrey Mainza, and he is now Chair in Sustainable Comminution, JKMRC, University of Queensland, Australia. A great testimony to the value of attending conferences- you never know who you will meet or what will transpire! As many of you know, I started my career as a freelance photographer, long before digital photos were even dreamt about, so I have a pretty good understanding of f-numbers, shutter speeds, film speeds etc. Which is why I marvel at the photo below, taken deep underground in the East Pool tin mine, Cornwall. What makes this even more remarkable is that it was taken by a Camborne photographer, John Charles Burrow, who died 100 years ago last October! During the early 1890s he was commissioned by the owners of four of Cornwall's deepest mines, Dolcoath, East Pool, Cook's Kitchen and Blue Hills, to capture life underground. In order to do this Burrow, a pioneer of early flash photography, had to overcome the formidable difficulties of illuminating the workings by artificial means. He used limelight to set up his tableaux, an intense illumination being created in limelight burners when an oxyhydrogen flame is directed at a cylinder of quicklime (calcium oxide). Limelights required a full-time operator to regulate the oxygen and hydrogen gases and rotate the block of lime but they were not suited to providing light for the photographs as limelight doesn't give off very much blue light, to which early photographic plates were sensitive, so very long exposures were needed in a light so bright that the subjects tended to close their eyes. Light for the photographs was provided by magnesium flash powder, magnesium mixed with an oxidising agent such as potassium chlorate, which would ignite with very little persuasion by means of a miner's candle. Such early flash photography was not synchronised of course. This meant that the camera had to be set up on a tripod, the shutter opened, the flash triggered, and the shutter closed again - a technique known as open flash. In order to illuminate large spaces in an underground mine the shutter had to be opened for multiple exposures, so as to use the flash at different places to provide more even illumination. 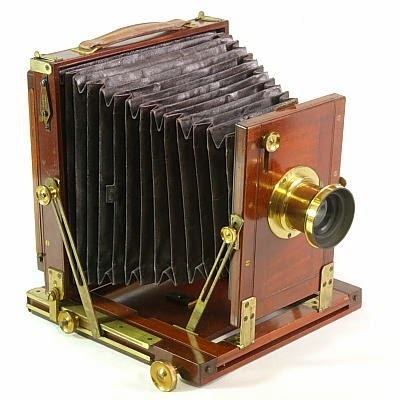 Due to its "lightness, portability and moderate size" his favoured camera was a half-plate Kinnear bellows camera, similar to that on the left, using double dark slides. The camera was mounted on a sliding tripod, as sometimes it had to be tilted at an angle of 60 deg, and the front leg tied to a rock to prevent overbalancing! His wonderful series of photos was published in a book, 'Mongst Mine and Miners, in 1893, co-authored by William Thomas who provided descriptions of the scenes and the methods of working. The book was used as a teaching aid at the newly formed Camborne School of Mining. Apart from the photographic obstacles that had to be overcome in those early days, there was also the considerable difficulty of transporting the camera, tripod, oxygen and hydrogen cylinders and flash materials underground, in light provided only by candles worn on helmets or caps. Ladders were most commonly used to progress from level to level, as shown in the photo on the right taken at the 180 level at East Pool Mine (the 180 level is 1080 feet below the surface, all depths in Cornish mines being measured in fathoms, a familiar measure to Cornishmen with their sea-faring tradition- similarly the head man on the mine was the Mine Captain, a term still used internationally today). 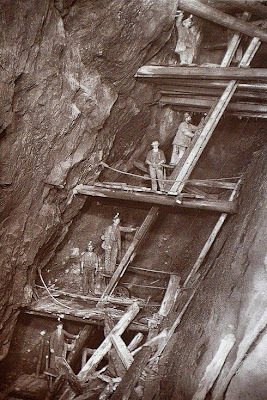 Mortality rate among the miners was very high, due to rock falls, bad air and lung disease, but also due to the state of exhaustion produced daily by climbing to and from work on the ladders, it not being uncommon for 3 hours of a working day being spent on the ladders. 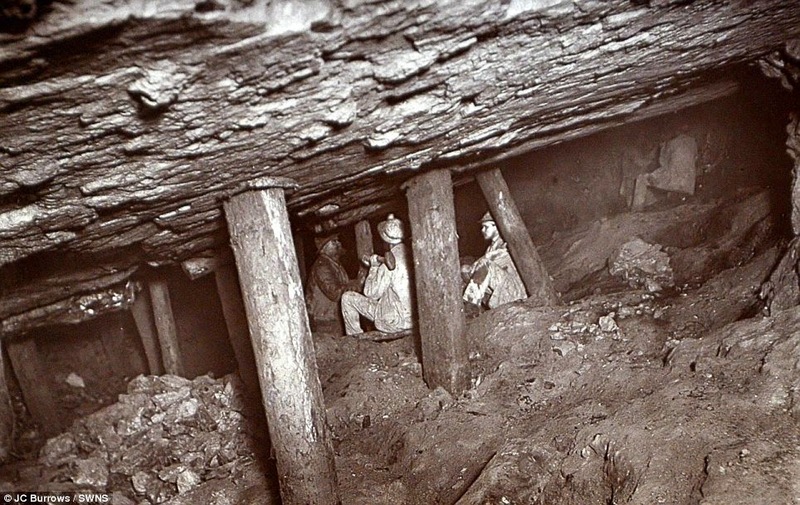 In the deeper mines man-engines were often installed, and the photo on the left shows Burrow's remarkable photo of the man-engine at Dolcoath. Essentially a moving ladder, the man-engine worked by fixing platforms on the wooden rods, connected to the beam engine on the surface, which moved slowly up and down in the shaft and which were connected to the pump at the bottom of the mine. There were platforms and handles on the side of the shaft with similar platforms and handles on the moving rod. To go up the shaft, the miner would step onto the platform on the rod and ride up to the next platform. Here he would step onto a platform onto the shaft. He would repeat this until he got to the top. Although intrinsically dangerous, the use of a man engine was in practice safer than climbing long ladders: it was less risky to be carried up at the end of a hard shift than to climb a ladder and risk falling because of exhaustion. It was also popular with the miners as they only got paid when they started work underground, so speeding up their journey to work increased their wages! And work was dangerous and arduous in the extreme. From the 17th century techniques for drilling holes in rock were developed. In Cornwall a drill rod, or ‘borer’ was used to create the hole using a hammer. The borer was turned after each hit of the hammer, which would chip out a piece of rock, eventually creating a round hole, or ‘shothole’. Gunpowder could be poured into the hole and ignited to blast the rock apart. Drilling holes in the hard rock of Cornwall was laborious and time consuming and it could take many hours of strenuous effort to bore a 2ft (60cms) hole. 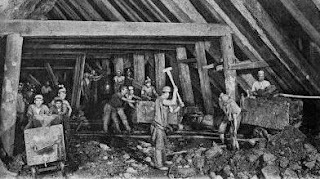 Where the lodes of tin ore were narrow, miners had to do single hand drilling. 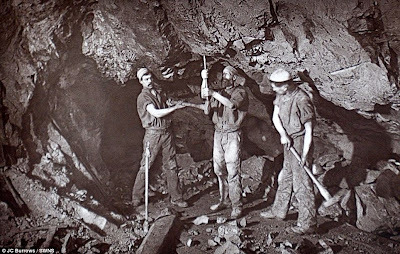 The miner held the drill rod with one hand and used the other hand to hammer. ‘Double handed drilling’ where one man held and turned the drill whilst it was struck by two men with hammers was faster and often practiced where the lodes were wider. In the photo below, taken at East Pool Mine, the holes are being bored vertically upwards and the man turning the drill rod must have had complete confidence in the skill of his colleagues! Fatalities and serious injuries were commonplace due to men falling from ladders due to sheer exhaustion, and to the ever-present threat of rockfalls, weak hanging walls being supported by wooden props, as in the first photograph above, where a suspicious part of the roof is propped by three pieces of Norway pine. 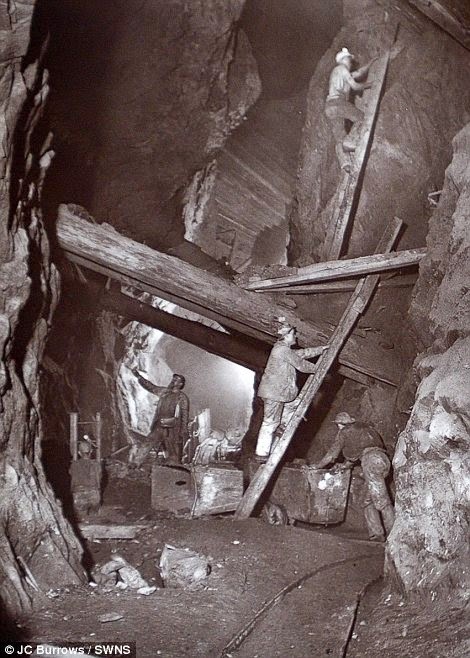 The photo below, at the Blue Hills Mine, shows men putting in a new prop to support the roof. The photo on the left was taken at the 412 level (2472 ft) level at Dolcoath Mine, where massive supports were in place, as the lode was of great width and the walls unreliable. Not long after Burrow took this photo the whole of the 'stull', or series of timbers, collapsed, killing seven of the men working underneath, one man being rescued unhurt after 37 hours. Mining in Cornwall will forever be associated with tin, but when mining was at its peak it was copper which was the major metal mined. By the early 19th century Cornwall was the world's greatest producer of copper, as by 1740 deep mining had been made possible by the invention of the steam engine which was used to pump the water from the mines (see posting of 25 April 2015). By the mid 19th century, however, the rich copper deposits had become exhausted, and with the discovery of huge deposits in America the price of copper fell. However tin ore had been found in some of the deeper mines and, although on a smaller scale than copper mining, this led to a second mining boom and almost half of the world's supply of tin in the mid-nineteenth century was mined in Cornwall and Devon. By the end of the 1870's, however, this premium position was lost, with the emergence of Malaysia as the leading producer, and the discovery of rich deposits in Australia. So by the time that Burrow took his photographs mining in Cornwall was in rapid decline and by the end of the century only nine mines of any consequence remained, where 300 had flourished 30 years earlier. Many mines closed in the 1890s and Cornish miners took their deep mining expertise to various parts of the world, notably the newly found deep gold reefs on the South African Witwatersrand. 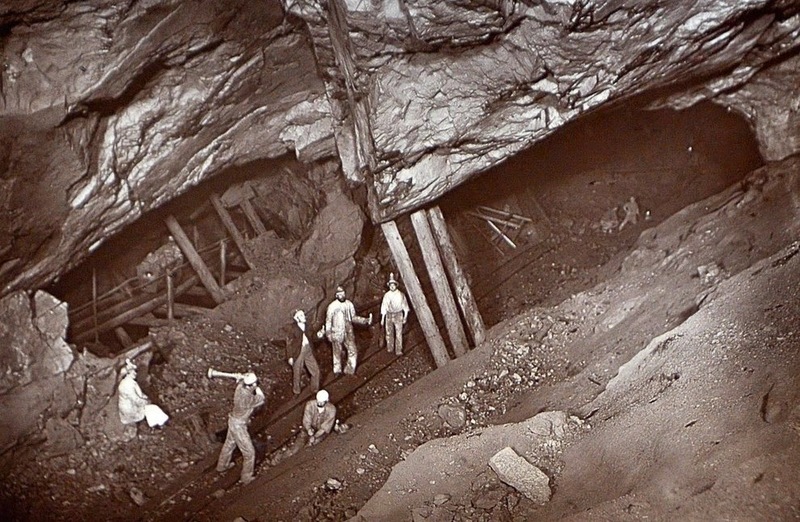 Some of the larger Cornish mines struggled on; Camborne's Dolcoath, the "Queen of Cornish Mines" originally mined copper but as this became exhausted tin was mined at depth and by 1882 had reached a depth of 2160 feet. It eventually became the world's deepest tin mine at 3300 ft but closed in 1920 when virtually worked out. 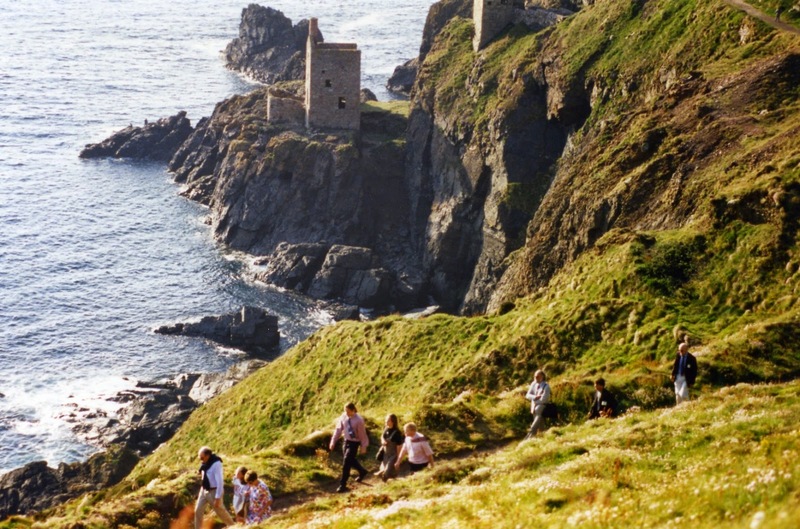 The last Cornish tin mine to close was South Crofty in 1998. Now all that remains of a once mighty industry are the evocative ruined engine houses, so much a part of the Cornish landscape, beloved of tourists, photographers and artists. But as you gaze in wonder at these crumbling granite structures, standing in now tranquil and stunning settings, spare a thought for the ghosts of those old miners who toiled and died in hellish conditions deep in the bowels of the earth, and were recorded for posterity by the camera of one of the great pioneers of photography, John Charles Burrow. Physical Separation '15 starts two weeks on Thursday, and we have a great list of international delegates, and a fine technical programme. It is not too late to register, and there is the added bonus of a pilgrimage to the historic Camborne-Redruth mining area, which in the 19th century was the centre of world copper and tin production. Physical Separation '15 immediately follows Computational Modelling '15, which begins two weeks on Tuesday. 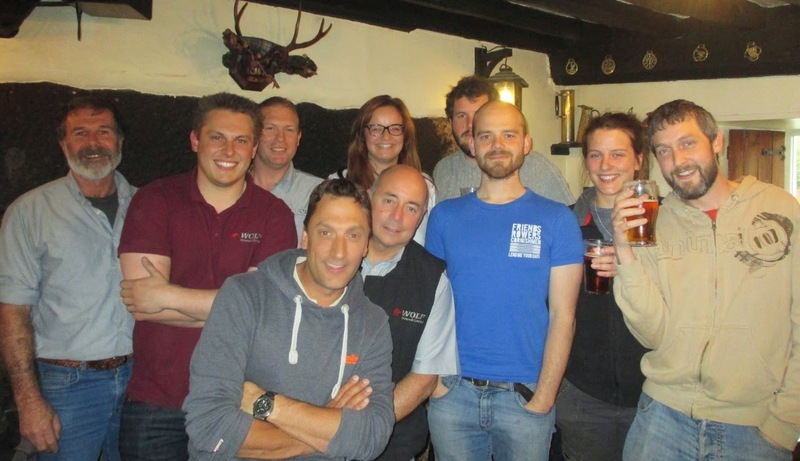 Despite many of the regulars being missing, there were several new faces at last night's Cornish Mining Sundowner at Falmouth's Chain Locker pub, with local companies SGS, Wardell-Armstrong and Grinding Solutions being well represented. 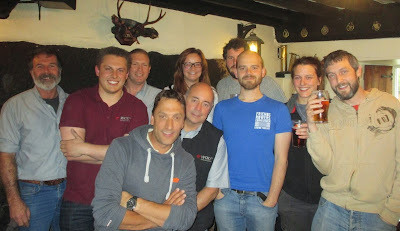 In the photo below I am with mineral processors from SGS, based at the old Wheal Jane site near Truro. Wardell-Armstrong is also based at Wheal Jane and Aaron Wilkins and Mark Mounde had invited their client Artem Zhuchkov of Kazax Minerals, Kazakhstan to the sundowner. A surprise, and very welcome, visitor was Linda Shimmield, who was a librarian at Camborne School of Mines in the late 70s and later became the first secretary of the CSM Association. She was on a flying visit to Cornwall from her home in Singapore. 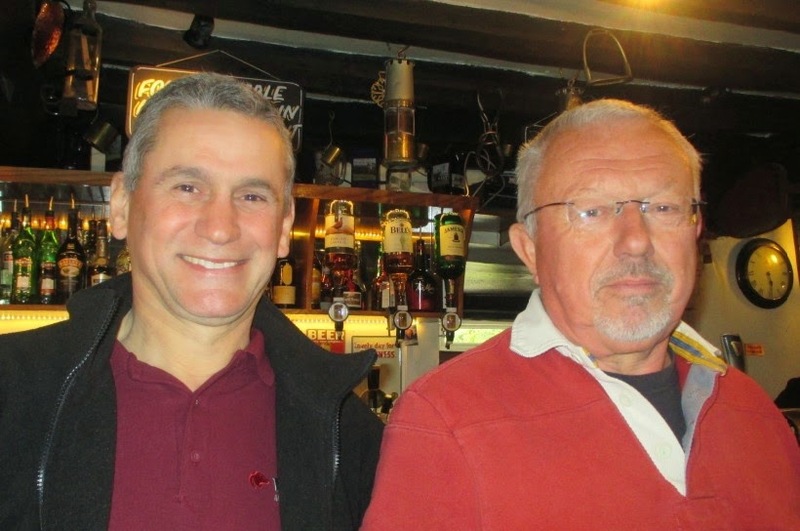 Also good to see Klaas van der Wielen and Steve Warren of Wolf Minerals, who in a few weeks' time will be shift metallurgist and shift operator respectively at the Drakelands tungsten mine in Devon. I will be at the Chain Locker again in just under 3 week's time, on June 9th with Computational Modelling '15 delegates, and two days later with Physical Separation '15 delegates. It will be good to see Charlie Northfield at the latter, who will be presenting a paper at the conference on the Drakelands Mine. Charlie is the Wolf Minerals Process Plant Manager and he tells me that construction of the plant is progressing well and Wolf Minerals personnel have been working hard on the preparations for the start of ore commissioning in early June. 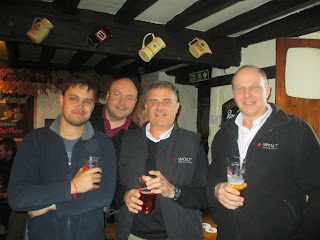 He sent me these photos of process plant supervisors, metallurgists and operators relaxing at the Devon mining sundowner held in the Miners’ Arms, Hemerdon on Friday 1st May. Good to see Klaas and Steve amongst them! 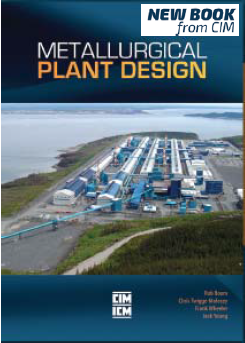 Metallurgical Plant Design is edited by Rob Boom, Chris Twigge-Molecey, Frank Wheeler and Jack Young, with many international contributing authors. While a great deal of literature on project and construction management exists, as do many reference books on the fundamentals of metallurgy and engineering principles, very little information is available on the design process, which translates these fundamentals into the design of a properly functioning metallurgical facility. This book, published by the Canadian Institute of Mining, Metallurgy and Petroleum (CIM) fills the information gap, prepared by a team of specialists from across the globe who have worked in the projects environment for most of their careers. Metallurgical Plant Design will interest anybody involved in the development and implementation of metallurgical plants, including owners, financiers, design engineers, process engineers, researchers, construction managers and project managers. Full details are available from CIM. 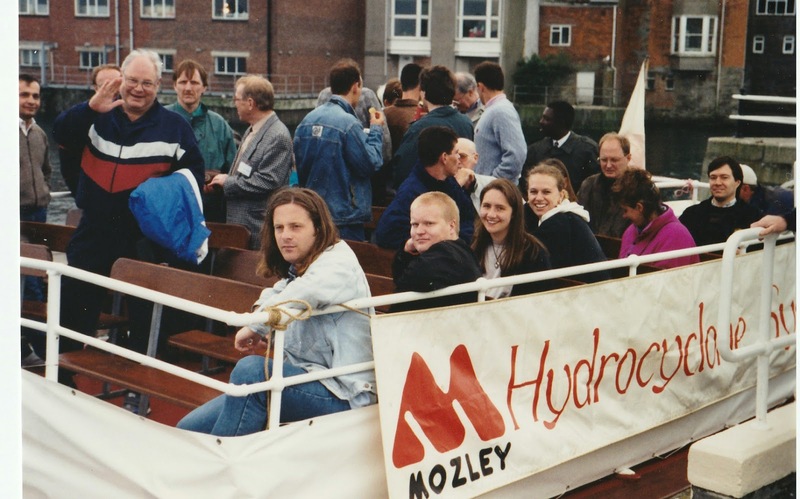 Just to remind you all that the deadline for abstract submission for Flotation '15 is now less than 2 weeks away, the end of this month. More details on the conference and associated workshop can be found on the blog posting of 6th April. Our next two conferences, Computational Modelling '15 and Physical Separation '15 are only three weeks away, and are shaping up to be great events. The programmes are available on the respective websites, and more details can be found in the posting of 18 August 2014. 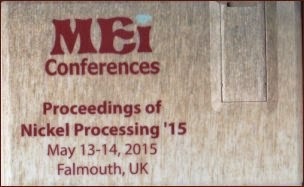 Nickel Processing '15 was held at the St. Michael's Hotel, Falmouth, Cornwall, from May 13-14 2015, and immediately followed Precious Metals '15 at the same venue. 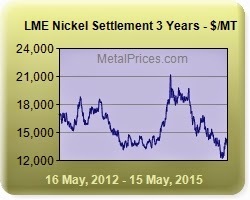 There is a current surplus of nickel at the moment, as demand for stainless steel has slowed, especially from China. 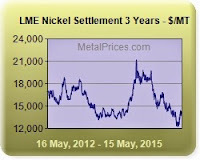 Nickel prices have therefore suffered greatly recently, so this, always the smallest of MEI conferences, was attended by a small group of specialists, 27 in number from 12 countries, compared with 35 delegates at Nickel Processing '12 in Cape Town. In all there were representatives from Australia, Belgium, Canada, France, Greece, Finland, Philippines, South Africa, Sweden, Turkey, UK and USA. Those that did attend the conference were treated to a fine programme of papers and I thank International Mining for their media support. Jon welcomed the delegates to Cornwall this morning and then introduced Anne Oxley of Brazilian Nickel Ltd, UK, who chaired the morning session. This opened with an excellent keynote lecture from one of my old CSM students, Andrew Mitchell of Wood Mackenzie, UK, who set the scene for the next 2 days by looking at the future of nickel production, particularly in relation to the outlook for nickel sulphide and laterite resource development (see posting of 8th December 2014). He forecast that nickel stocks should move into deficit by the end of the year, which will push prices higher, and that there is no question that the future of nickel supply will depend on laterites. First Quantum’s Kevitsa Mine is located in northern Finland and mines a large, low grade, polymetallic orebody. Payable metals include nickel, copper, gold and PGM group metals. Profitability, at high volume, low grade operations like Kevitsa, is highly geared to metal prices and process improvements. Since the operation commenced there has been a focus on maximising the separation process so as to improve the Cu-Ni process profitability. Ishmael Muzinda of First Quantum outlined a number of these process improvements, their introduction and efficacy with a focus on the work to improve fines flotation recovery. The post-coffee break session was chaired by Neil Snyders of the University of Stellenbosch, South Africa. Nickel is the predominant product at the Nkomati mine in South Africa. High grade nickel mineral ores (2%) from the Massive Sulphide Body have been depleted leaving those of low grade (0.3%). Consequently, the beneficiation of this nickel ore presents a challenge to the minerals processing industry. In response, Westhein Maree of the Cape Peninsula University of Technology showed how batch froth flotation tests were used to explore the effects of mixtures of potassium amyl xanthate and Senkol 700 on the recoveries and grades of nickel. In the mixtures, the xanthate accounted for 95.5, 90, 85 and 80 mole% respectively. This approach has a potential for enhanced recovery and subsequent grade of nickel and will have significant positive economic effects. Akira Otsuki of the Université de Lorraine, France presented work on a study aimed at investigating the sulphidisation-flotation of nickel oxide, the major nickel form available in nickel laterite. Sulphidisation was conducted before flotation to convert the surface of nickel oxide to nickel sulphide. It was good to have Nevill Rice at the conference. 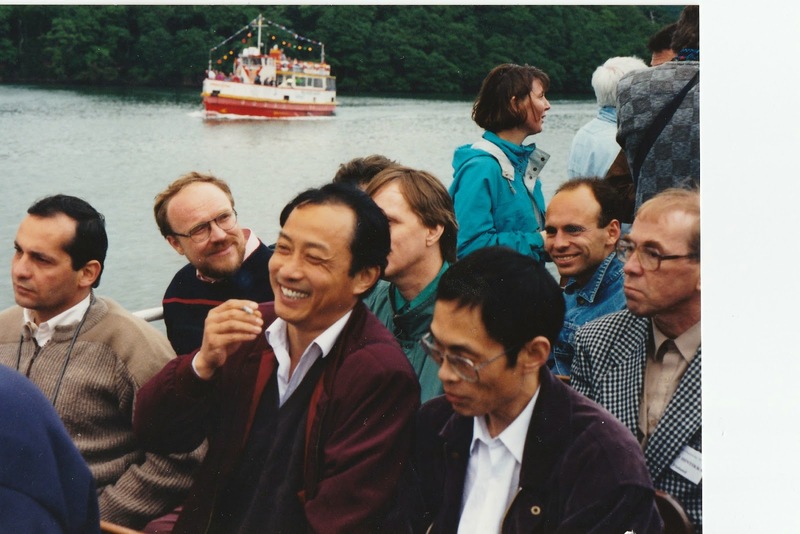 He was at the University of Leeds for 32 years and retired in 2002. Still keeping in touch with the industry by reviewing papers for journals, and meeting up with old colleagues, he gave a presentation on a hydrochloric acid process route for nickeliferous laterites. The short afternoon session was chaired by Barry Lumsden of Ausmetec Pty Ltd, Australia. In the first paper Paul Norris of Camborne School of Mines discussed the continuous processing of nickel/copper concentrates in bioreactors at high temperature. Inhibition of the thermophiles at high mineral pulp densities in primary reactors and the length of residence times for efficient copper extraction have been among the factors considered in continuous process development. The final paper of the day was presented by Keisuke Shibayama who presented the commissioning and operation status of the Taganito HPAL Plant Project in the Philippines. This project will produce 30,000 Ni-tons and 2,600 Co-tons per year as mixed sulfide for export to the SMM Nickel Refinery in Japan. The plant commissioning was completed on June 2014 and the operation has been running smoothly and has reached monthly production corresponding to its nameplate capacity. After a great first day of papers, I led the usual three and a half mile walk into old Falmouth, where we met up with other delegates for good Cornish ale in the 17th century Chain Locker pub (see also posting of 14th May). There were some very interesting papers in this morning's session, chaired by Nevill Rice and Camborne School of Mines' Chris Bryan. Graham Brock of Direct Nickel Projects, Australia described "breakthrough technology" which leaches the full nickel laterite profile in nitric acid giving significant reductions in capital and operating costs compared to current technologies (see also MEI Online, December 3rd 2014). Graham effectively retired from Direct Nickel at the end of 2014 but now continues as a non-executive director and as a consultant. Following this interesting presentation, Anne Oxley, of Brazilian Nickel Ltd, UK) asked "why heap leach nickel laterites?" With the majority of nickel naturally occurring in laterite ores but the majority of production still in sulphides, she argued that it is high time there was a standalone commercial nickel laterite heap leach operation. The broad success of heap leaching of other metals has allowed hitherto uneconomic deposits to undergo successful economic exploitation, and heap leaching now accounts for between 25% and 40% of global copper and gold production. Nickel laterites are no different, every major and several junior nickel miners have evaluated nickel laterite heap leaching over the past decade and shown projects to have robust economics, with much lower capital costs than alternative hydrometallurgical options which have in general been dismal failures, both technically and commercially. Nickel Laterite Heap leaching is simple and flexible, and can be applied to the many laterite deposits that currently have no realistic path to production. This set the scene for another interesting paper on laterite heap leaching. Akira Otsuki of the Université de Lorraine, France, explained the development of a characterisation method for partiallysaturated agglomerate beds in relation to nickel heap leaching operations. The final paper of the morning was given by Georgios Bartzas of the National Technical University of Athens, who presented a case study on the life cycle assessment of FeNi production in Greece. Ferronickel (FeNi) is predominantly produced from nickeliferous laterite ores which are converted into a product with a nickel content of around 20%. With increasing emphasis being put on energy efficiency and global climate change, it is important for the nickel industry to understand in depth the energy use and to evaluate a number of potential opportunities for reducing the greenhouse gas footprint of primary FeNi production. Akira Otsuki chaired the final session of the conference, which contained 4 presentations, from Australia, Canada and Sweden. James Vaughan of the University of Queensland discussed the properties of a commercial solvent impregnated cation exchange resin for cobalt-nickel separations. The hydrometallurgical processing of nickel ore typically involves precipitation of a mixed nickel-cobalt intermediate precipitate, as selective separation of these two elements by sulphide or hydroxide precipitation is not feasible. However this is not necessarily required; for example “direct” two-stage solvent extraction was practiced at the Bulong refinery where a Cyanex 272 containing organic liquid was used to separate Co, Cu, Zn and Mn from Ni. Complexities associated with this process include the requirement of a flammable organic diluent, phase separation equipment as well as the risk of organic cross-contamination. He described an ion exchange resin process whereby the value metals Ni and Co are both loaded onto the cation exchange resin and separated in the elution stage. As nickel is preferentially loaded, a larger volume of resin is required translating to a significant capital cost for the resin inventory. Solvent impregnated resin offers the engineering advantages of ion exchange resin and the chemical selectivity of the solvent extraction process. Nickel laterites are more difficult to process compared to sulphide ores due to their complex mineralogy and as a result, current industrial processes are energy intensive and costly to operate. Novel pyrometallurgical processes regarding the upgrading of nickel laterites are also being continuously investigated through laboratory research and pilot plant testing and Richard Elliott, of Queen's University, Canada, reviewed the current state of the art and discussed the potential applications of developing processes. In a further paper from Queen's, John Forster presented results on the microwave carbothermic reduction processing of a silicate nickel laterite ore. The effects of processing time, microwave power, and charcoal and pyrite additions were investigated. The reduction process was followed by magnetic separation and optimum nickel grades of about 9% and recoveries of about 90% were achieved. John Forster and Richard Elliott of Queen's University Canada. This was their first visit to Europe, so Falmouth was a pretty good choice! Srinivasan Suresh of Sweden's Luleå University presented the final paper of the conference, a study of the reduction of nickel oxide by hydrogen under microwave irradiation. He showed that reaction rates were significantly improved for microwave experiments under all conditions when compared to conventional heating. Therefore, it was concluded that microwave heating would significantly reduce processing time and enhance reaction kinetics and it has a potential to overcome several rate controlling steps involved in conventional processes. Amanda then closed the conference, and invited delegates to attend Nickel Processing '17 in Falmouth in 2 years' time, when hopefully Andrew Mitchell's forecast of increasing nickel prices will boost this small but important sector of the base metals industry. The papers from the conference, in unrefereed form, are available from MEI, and authors have been invited to submit their final papers for peer-review, for possible publication in a special issue of Minerals Engineering. 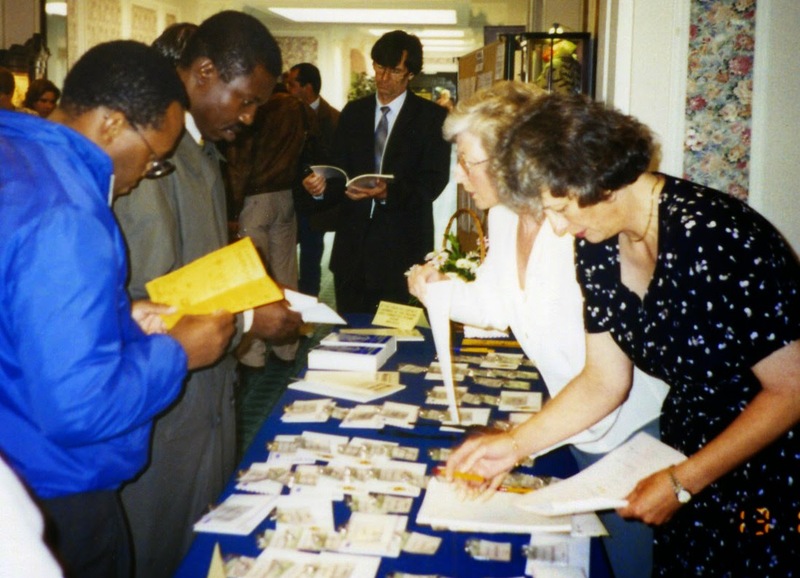 Precious Metals '15 was held at the St. Michael's Hotel, Falmouth, Cornwall from May 11-12 2015. Precious metals have fallen on hard times recently, with low prices exacerbated by rising production costs, so it was always inevitable that Precious Metals '15, the 5th in the MEI series of highly focused conferences, would be small (see also posting of 11th May). This year's delegate list comprised 29 delegates, representing 12 countries, compared with 51 delegates at Precious Metals '12 in Cape Town, and 55 at the last Falmouth conference in 2010. Those that did attend were treated to 2 days of high quality papers on the recovery of gold and PGMs from primary and secondary sources, and I thank ZEISS for recognising the importance of this small conference by providing corporate support, and to International Mining for their media support. I welcomed the delegates to Falmouth this morning before introducing the first session chairpersons, Al Cropp of sponsor ZEISS, and Marian Tredoux of South Africa's University of the Free State. The conference then got off to a fine start with the keynote lecture, given by Jacques Eksteen of Curtin University, Australia, who reviewed recent innovations in the processing of difficult and low grade gold ores (see posting of 30 June 2014), such as the need to reject valueless gangue early in the process by jigging or electronic sorting, which will be reviewed in more depth in next month's Physical Separation '15 conference. There are of course intense social pressures on the use of traditional cyanide leaching and there is an urgent need to find viable alternative lixiviants. Potential alternatives are environmentally friendly amino-acids which Jacques discussed in some depth. He also mentioned the use of alkaline sulphide leaching, which was discussed more fully by Corby Anderson of Colorado School of Mines, the other CSM, his paper dealing with many of the fundamental concepts behind this selective gold leaching and recovery system. Following coffee Akira Otsuki of Université de Lorraine, France, showed how coal-oil gold agglomeration could be used to assist flotation to recover gold from refractory ores. Steve Flatman, of Maelgwyn Mineral Services, UK then described the development of the Aachen Reactor high shear mass transfer device from its original concept twenty years ago to its acceptance in 2014 as an important unit process in one of the world’s newest large gold processing plants, producing over 1 million ounces of gold per year, where nineteen Reactors are installed in various applications. It is now possibly one of the most significant advances in gold processing since the introduction of the carbon-in-pulp process in the late 1970’s. Sustainable development is a major focus of worldwide research in the gold mining industry. An alternative gold processing method which is more environmentally friendly than cyanidation and amalgamation is, therefore, imperative. This is the thrust for the work described by John Ajayi of the Federal University of Technology, Nigeria, who showed that the alkaline salts of groundnut and palm kernel are potential flotation reagent substitutes for the conventional synthetic reagents. Though the pronounced effect of the caustic cyanide pre-treatment step for the AARL gold elution process has been widely investigated, research into the reaction kinetics of this step are lacking and a set industry standard is yet to be determined with regards to pre-treatment time and reactor conditions. Neil Snyders of the University of Stellenbosch, South Africa presented results on a study of the effects of the pre-treatment temperature, contact time and agitation on the gold elution recovery and in light of these results, proposed pre-treatment mechanisms were reviewed and discussed. Dave Dreisinger of the University of British Columbia presented the first paper of the afternoon session, chaired by James Vaughan of the University of Queensland, on the dissolution of gold during the pyrite oxidation reaction. Although numerous papers discuss the mechanism of alkaline oxidation of pyrite there is limited information available describing the actual kinetics of the pyrite sulphide to thiosulphate reaction. A previous investigation in this series determined the rate of sulphide sulphur oxidation and thiosulphate yield in the reaction of pyrite with sodium hydroxide under various testing conditions. The goal of the current study was to validate these rates using two different gold-containing pyrite concentrates, a further objective being to investigate the simultaneous dissolution of gold with in situ formed thiosulphate during pyrite oxidation. Jacques Eksteen of Curtin University, presented his second paper of the day, on gold extraction from a gold-copper concentrate in solutions containing caustic soda and low free cyanide. Copper-gold ores containing significant amounts of cyanide-soluble copper with gold can lead to high cyanide consumption with low gold extraction in the cyanidation process of gold. Cyanide should be destroyed before the discharge of tailings containing metal-cyanide complexes. This significantly increases the cost to the gold mining companies to cover both the cyanide consumption in the leaching stage and the additional cost of the required reagents for cyanide destruction. Results on the selective cyanide leaching process of gold over copper from a copper-gold concentrate were presented. Gawen Jenkin of the University of Leicester, UK, presented an interesting paper showing how ionometallurgy could offer a new set of environmentally benign tools for metallurgists to augment existing techniques. Ionic liquids are anhydrous salts that are liquid at low temperature. They are powerful solvents and electrolytes with potential for high selectivity in both dissolution and recovery. Those pioneered at Leicester are deep eutectic solvents (DES), which are environmentally benign, chemically stable and the components are already produced in bulk at low cost. Gold (electrum), tellurium, galena and chalcopyrite, as well as tellurobismuthite (Bi2Te3), are soluble in DES by oxidation at 45-50°C at very favourable rates compared to bio-oxidation or high-temperature hydrometallurgy. Gold can be recovered from solution by electrodeposition. Pyrite is notably insoluble under the same conditions, but pyrite, arsenopyrite, and indeed any sulphide, can be selectively dissolved by electrolytic reduction in a DES, thus suggesting a protocol whereby gold inclusions can be liberated by reduction and then dissolved by oxidation. The final paper of the day was presented by Seija Kurki, of Outotec, Finland. She introduced the new Outotec® Hydrometallurgical Precious Metals Process, which enables cost-efficient fully hydrometallurgical precious metals recovery from copper electrorefining anode slimes. The process is based on leaching of copper, selenium, silver and tellurium in sequential H2SO4 leaching steps, ensuring high recovery rate and high purity of the precious metals and saleable side products. H2SO4 solutions can also partly be recycled back to electrolysis or electrolytic solution purification. The majority of the delegates joined me in the late afternoon for the usual MEI conference walk along the coast to old Falmouth, and a chance for everyone to get to know each other over drinks at the 17th century Chain Locker pub by the inner harbour (see more photos on the 12th May posting). A later start than scheduled due to a speaker withdrawing at the very last hour, which was disappointing as two of the co-authors are based at the nearby Camborne School of Mines. The morning session was chaired by two of yesterday's speakers, Corby Anderson and Dave Dreisinger. Neil Snyders, of the University of Stellenbosch, South Africa, showed how several individual gold cyanidation processing techniques were combined into different flowsheets to recover platinum group metals (PGMs) from dilute cyanide leach solutions. Four flowsheets were developed, consisting of a SART (sulphidization, acidification, recycling, and thickening) process, precious metal recovery by either adsorption onto activated carbon or ion exchange resins, followed by elution, and final metal recovery through thermal hydrolysis and/or electrowinning. These flowsheets were simulated in combination with economic analyses to determine the option that yields high PGM recoveries with maximum net present value (NPV). Ion exchange resin technology was found to be best, with a NPV significantly higher than for the carbon-based flowsheets. The best flowsheet option utilized the strong-base Amberlite PWA 5 ion exchange resin and elution with zinc cyanide. The proposed final metal recovery was by means of thermal hydrolysis and electrowinning. This option requires low capital and operating costs, while achieving high PGM recoveries. There has been a steady increase in the amount of Precious Metals (PM) and Platinum Group Metals (PGM) being recovered from secondary sources in recent years, driven in large part by high commodity prices and a rapid growth in automotive catalyst recycling. The increasing costs and complexities associated with the primary extraction of PM/PGM and the lower costs and environmental impacts of recycling-based extraction have provided added incentives for this growing trend. As a result, the last few years have also seen a substantial uptake in PM/PGM recovery using Tetronics’ DC plasma smelting technology, particularly for the recovery of PM and PGM from automotive catalysts, chemical catalysts and electronics waste as a result of the ability of Tetronics’ plasma smelting technology to achieve high recovery rates from a range of materials. Saeed Ismail, of Tetronics International, UK discussed Tetronics’ plasma smelting technology and gave details of plant performance in the recovery of PM/PGM from catalysts and other materials. The range of metals applicable to this technology were also discussed and results from a number of secondary sources provided. The ZEISS Mineralogic Mining was showcased at Process Mineralogy '14 . The release of ZEISS Mineralogic Mining has provided an extra dimension to the world of Automated Mineralogy (AM) through the utilization of a fully quantitative Energy Dispersive Spectroscopy (EDS) mineral classification system and advanced image analysis capabilities. Unlike the current AM techniques, the mineralogy is classified by using the wt% contribution of the elements present, and thus, the minerals stoichiometry. This method provides the operator a more accurate, flexible and efficient method for generating mineral classifications. ZEISS have developed the capability to correlate Light Microscope (LM), Scanning Electron Microscope (SEM) and AM coloured mineral maps for more efficient and seamless analysis between these techniques in order to make the most of the information each technique provides. Shaun Graham of ZEISS presented an example of correlating these techniques for locating and identifying Base Metal Sulphides (BMS) and Platinum Group Minerals (PGM) from PGE-bearing chromitite from the Berit ophiolite, Turkey, showing how ZEISS is able to provide a fully automated and correlated analysis across LM - SEM - AM techniques. Ancuta Musina of Magpie Polymers, France, presented results on the recovery of PGMs from industrial effluents by an innovative process involving sorption on a functional polymer, MP-101, containing aminophosphine groups. Sorption performances and mechanisms onto MP-101 were investigated and compared to other commercial PGM sorbents with a targeted metal, the Pd. The results showed higher sorption capacities of MP-101 because of the high phosphine groups content, giving it potential applications in refining and mining industries. Separation of metals loaded MP-101 from effluents was achieved by flocculation-decantation processes and PGMs were recovered in metallic form by incineration. This process combining sorption and decantation was successfully applied on two industrial solutions from mining and recycling industries, highlighting the selectivity of MP-101 toward precious metals. The Bushveld Igneous Complex (BIC) situated in Northern South Africa is the largest deposit of platinum group elements (PGE) in the world. Froth flotation is used to beneficiate these PGE ores in the BIC due to their close association with the base metal sulphides. The performance of the froth flotation process is largely dependent on the chemical additives used in the process. Consequently, chemicals, especially collectors, have been used in mixtures to combine the individual properties of the respective chemicals. Westhein Maree of the Cape Peninsula University of Technology, South Africa, reported on the concentrate grades and recoveries achieved in batch flotation tests using various molar mixture ratios of thiol collectors on a Merensky Reef platinum ore. Collector mixtures of a xanthate (SIBX) with a dithiophosphate and a dithiocarbamate at 20, 40, 60 and 80 mole% ratios were considered. The final session of the conference, chaired by Saeed Ismail of Tetronics International, commenced with a presentation by Ryo Kasuya of the National Institute of Advanced Industrial Science and Technology, Japan, who discussed the dissolution of platinum in catalyst materials. Currently PGMs are recovered after dissolution in strong acids that contain toxic oxidizing agents such as aqua regia. To avoid the use of such toxic agents a route to dissolve PGMs in hydrochloric acid via complex oxides was proposed. The Pt complex oxides were prepared by calcining mixtures of Pt/Al2O3 and alkali metal salts at 600-800°C in air and they were then dissolved in HCl. The results showed that Pt in the calcined samples easily dissolved in HCl, and the Pt solubility recorded over 80% after dissolution at 80°C, so the process is probably applicable to the Pt catalysts after refining. Processing of platinum-group element (PGE) ores is based on the assumption that the primary association of these elements is with sulphide, i.e. covalent bonding between PGE cations and S2- anions. In order to explain the tenor of the PGE in economically viable ores, the PGE must favour such bonds 105 times over either remaining in solution in the magma or entering co-precipitating silicates (olivine, pyroxene, plagioclase) and oxides (chromite). Experimental work presented by Marian Tredoux of the University of the Free State, South Africa, has not confirmed this, and led the authors of the paper to speculate that a more primary association might be involved, i.e. that the formation of PGE minerals are preceded by nano-entities. The presentation reported on an experiment which proved that nano-association of Pt and As does occur at magmatic temperatures long before sperrylite can stabilise. The results could have profound influence on the design of future PGE beneficiation plants. Direct electrowinning (EMEW) is an emerging technology within the precious metal extraction sector with a number of applications including silver recovery. In the final presentation of the conference Arun Vathavooran, of Tetratech Minining & Minerals, UK, discussed the testing and scale up of the EMEW technology for a high grade, low throughput silver deposit in Yukatia. The testwork and the analysis has indicated that the EMEW technology can be effectively utilized for selective silver recovery from polymetalic ores with potential operating cost savings for silver head grades as low as 150g/t. Amanda closed the conference and invited delegates to attend Precious Metals '17 in Falmouth in two years time, when hopefully the market situation will have improved. We have thoroughly enjoyed the two days of Precious Metals '15 with a great group of people, who all seemed to appreciate the small focussed conference format. High resolution image of all photos in the blog can be obtained by clicking on the image.